Secretary-General António Guterres speaking at the High-Level Meeting on Financing the 2030 Agenda for Sustainable Development, at UN Headquarters in New York, on 24 September 2018. 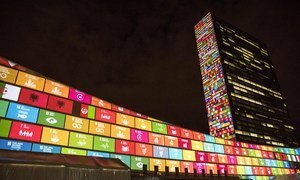 A “surge in financing and investments” is needed to achieve the 2030 Agenda, the United Nations plan of action agreed by Member States, to transform the world, the Secretary-General said on Monday. António Guterres was speaking at the opening of the High Level Meeting on Financing the 2030 Agenda, at which he launched his Strategy to support Financing the 2030 Agenda. He was joined by Christine Lagarde, Managing Director of the International Monetary Fund (IMF), several Heads of State and Government, as well as senior representatives of leading companies – including the founder of Microsoft, Bill Gates – and philanthropic foundations. The financing needs of the 2030 Agenda, said Mr. Guterres, are immense, in the order of between $5 and $7 trillion per year. Mr. Guterres outlined three “essential action points” for developed countries: meeting the commitments made in the Addis Ababa Action Agenda; continued support for developing countries in creating good governance measures and fighting illicit flows of capital; and stepping up efforts in developing innovative financing and in mobilizing private investment. The Secretary-General’s new Strategy to support Financing the 2030 Agenda builds on existing efforts and proposes urgent action to achieve three objectives: aligning global financial and economic policies with the 2030 Agenda, enhance sustainable financial strategies at the regional and country levels, and exploit the potential of financial innovations, new technologies and digitalization to provide equitable access to finance. On this latter point, Mr. Guterres announced that he had tasked Achim Steiner, head of the United Nations Development Programme, UNDP, with setting up a Task Force on the Digital Financing of the Sustainable Development Goals. Bill Gates speaking at the High-Level Meeting on Financing the 2030 Agenda for Sustainable Development, at UN Headquarters in New York, on 24 September 2018. Bill Gates underlined the ways in which philanthropic organizations, such as the Bill and Melinda Gates Foundation, play an important role in advancing the system, using innovative tools that allow them to invest in new technologies, make innovation less risky, and address market failures, and pointing out that the development finance system is key to achieving the objectives of the SDGs. You can find out more about the financing of the 2030 Agenda here. 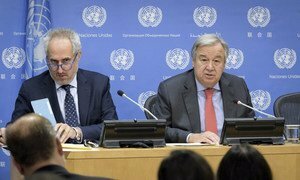 António Guterres launches his strategy to finance the 2030 Agenda to put the world on a more sustainable path, this 24 September, ahead of the General Assembly’s annual general debate.